Mary H.K. Choi is a writer for the New York Times, GQ, Wired, and The Atlantic. She has written comics for Marvel and DC, as well as a collection of essays called Oh, Never Mind. She is the author of Emergency Contact, which was a New York Times bestseller, and Permanent Record. She is the host of Hey, Cool Job!, a podcast about jobs and Hey, Cool Life!, a podcast about mental health and creativity. Mary grew up in Hong Kong and Texas and now lives in New York. Follow her on Twitter at @ChoitotheWorld. * "Choi sensitively shows the evolution of two lonely, complicated people who slowly emerge from their shells to risk an intimate relationship. Her sharp wit and skillful character development...ensure that readers will feel that they know Penny and Sam inside and out before the gratifying conclusion." "Smart and funny, with characters so real and vulnerable, you want to send them care packages. I loved this book." * "Choi creates an up-to-date and realistic contemporary romance by upending the love story trope....A highly recommended purchase for the teens who enjoy realistic relationship fiction. Recommended for fans of Nicola Yoon’s Everything, Everything and Rainbow Rowell’s Eleanor & Park." "Readers will swoon over Emergency Contact. 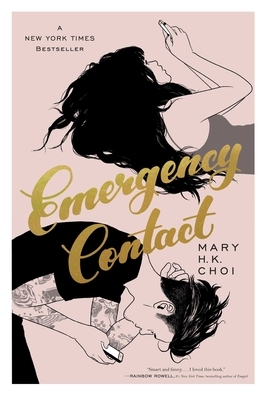 Choi has a knack for creating relatable characters, and this quirky, socially awkward love story will keep your cheeks rosy with every page....Emergency Contact is the perfect book for those who root for the underdog and believe that broken people can heal together." "Blushingly tender and piquant...Choi... inserts timely issues like sexual assault, cultural appropriation and even DACA into her characters’ intimate conversations, but it is her examination of digital vs. F2F communication that feels the most immediate." "Readers who enjoyed the unorthodox evolution of romance in Nicola Yoon’s Everything, Everything (2015) will like this debut novel." "Penny somehow broke down all my walls. Her tech became incidental and her voice endearing, and just like that, I was hooked. Even the texts feel very natural and elegantly woven into the narration.There is much more to both Sam and Penny than quirky character traits and witty repartee....While the story does traffic in the heart flutter of romance that is tantalizingly out of reach, its emotional core goes deep." "Whip-smart, hilarious and poignant...Choi's prose is to be savored....Along with the biting wit and sharp observations, Choi's marvelous novel offers a perceptive exercise on the divide between digital and in-person communication - and how daunting it can be to 'escalate' to that face to face encounter." "A tender, texting-based teen romance." "The sweetest book I read this year." "Emergency Contact is a sharp, funny, and adorable young-adult romance, but it’s also a pretty great story about two people living with differing levels of anxiety...you’ll relate to the characters in this book, and you’ll root for them, too."